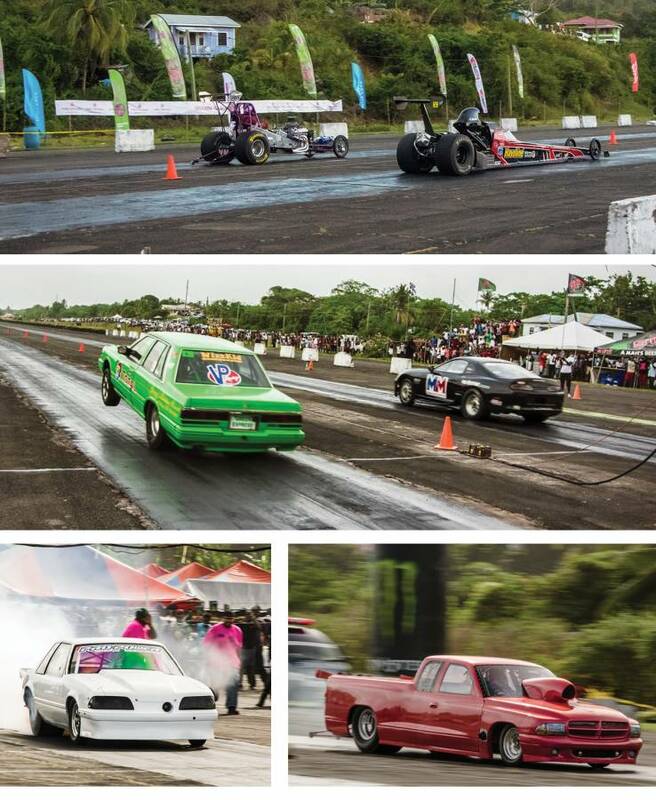 Grenada’s 12-year racing record broke on Sunday, 21 May at Pearls Speedway, St Andrew, at the Grenada Motor Club’s (GMC) first International Drag Racing event for the year. Visiting Trinidadian racer Andy Bissessar, who was racing in Grenada for the very first time, broke the record by driving an 850 horsepower long rail, over a quarter mile track in 7.4 seconds, beating the longstanding record of 7.9 seconds. Bissessar also currently holds the record in Trinidad with a best time of 7.2 seconds. Trinidadian and veteran racer Hollister ‘Flambo’ Edwards, a regular visitor to Grenada, and GMC’s own expert for the very important task of track preparation, took 2nd place. A good turnout of drivers and racing enthusiasts from the Caribbean region including St Maarten, Anguilla, St Vincent and long term supporters Trinidad & Tobago, well supported the 2-day event. There was a strong presence from Grenadian drivers and approximately 4000 local supporters on the spectator banks, including Parliamentary Representative for St. Andrew, Hon Yolande Bain- Horsford. A special effort was made to speak with participating drivers and get their views on how they enjoyed the event and the improvement opportunities for Grenada and the GMC. Participants from Anguilla and St Maarten were impressed with the level of emphasis placed on this International Event. They made particular note of the increased number of ‘Test & Tune’ events, held by the GMC for local racers throughout the year, to improve competition skills and the sport overall. They commented that further investment in the Caribbean region’s racing sector would provide the impetus for an increase in the sports tourism visitor niche, and ultimately be beneficial to all participating islands. The GMC continues to lay strong emphasis on the safety aspect of the event with their motto ‘Drive on the Road, Race on the Track’. To assist the crowd in putting the ‘Brakes on the Litter,’ receptacles were placed in the pit and bank areas. A clean-up crew was engaged in encouraging all to keep Grenada clean. Public Relations Officer of the Grenada Motor Club, Ian DaBreo thanked the sponsors, participants, supporters and organisers for making this year event another resounding success. The GMC announced its second 2017 International Drags event to be held from 10 to 12 November 2017.